Right now at Target, shoes, sandals, and handbags are Buy One, Get One 50% Off. That's right - womens' shoes, as well as select summer kids' shoes and girls' shoes. So go there and save! Want to look great this summer while saving some cash? Well, Cost Cutters has some mobile coupons that will help you do just that! Sign up for their reminder service and save $2 on your next haircut. Shampoo and conditioner is also currently Buy One, Get One 50% Off at participating salons while supplies last. Breakfast can be delicious AND cheap! Save $1 on any 2 Cream of Wheat products with a coupon! And then once you've snagged your coupon and saved on your Cream of Wheat, check out some awesome recipes to use those products in! Want your house to smell fantastic this summer and save money by buying online, but worried you won't like what you order? Request a free scent sample from Signature Scent and remove the mystery from online sachet, bath & body scents! Signature Scent crafts custom-scented bath & body products. I just requested my free sample - give it a try! Remember to Sign up for emails from Barnes&Noble - I just received an exclusive coupon in my email! You could really be missing out! And don't forget - if you spend $25, you get FREE shipping from Barnes&Noble! Now's the time to stock up on books for summer reading, whether it's at picnics, the beach, on your front porch, or inside of your home. HALO has more printable coupons for you, for things like $1 off any can of Spot's Stew, $2 off a Chews bag, or $3 off a 6 lb bag of Spot's Stew. So if you want to keep your pet eating great but not let them eat you out of house and home, this is a great chance to grab some coupons! And don't forget to subscribe to their newsletter. 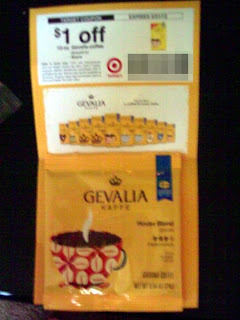 Gevalia Freebie Arrived! Save 15% AND May Clearance Sale! We often sign up for the freebies we post here. 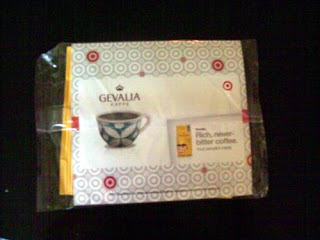 Today, a Gevalia Coffee freebie arrived in the mail! Look at that - a full serving of coffee. 4 cups. I think this is the largest coffee sample I've gotten. And a coupon, too! Man, I love freebies. So anyway, Gevalia has some new offers you probably want to know about! Right now, if you sign up for their Newsletter, you'll receive a special checkout code for 15% off! You'll also get FREE shipping on your order of $30 or more! And don't forget about their Refer a Friend Program, which might help you snag a free box of coffee. You might want to tell that friend about their May Clearance Sale, where there are all kinds of awesome coffees for sale for up to 67% off. Did you know that you can trade in electronics at a partcipating Best Buy store or Online in order to receive a gift card for the value of your item (or, if it has no Trade-in value, have it recycled for free)? Pretty neat, eh? So if you have electronics lying around that you never use, you might check the trade-in value on the Best Buy website and see if you can trade it in and snag yourself something nifty ;-) or, at the very least, recycle it. I think that last part's particularly cool because sometimes you just don't know what to do with an old computer that you can't safely toss in the dumpster! Join JustFab Today and take advantage of their Buy 1 Get 1 Free Sale! The sale is for new members only, and you have to join JustFab to take advantage of it, but 2 pairs of shoes for just $39.95? What a deal! Right now, get 20% off your first order on SOAP.COM with purchase of any household product with coupon code HHSAVINGS. Max discount $20. Code MDAY2012 will also save you money on Mom's morning must-haves! They don't just have soap and household products, they have all kinds of things, so definitely take a look! Visit MinuteClinic's Facebook page to snag a coupon, good at any CVS/pharmacy through May 20, for a FREE moisturizing body wash! In celebration of Mother's Day, no less! Does your hair need a little TLC, but so does your wallet? Snag this coupon and save $1.00 on Dove Hair Therapy Nourishing Oil Care. As usual, read the terms and conditions. Barnes and Noble: $20 Off Nook Color and Free Gift Bag! Just in time for Mother's Day: get a Nook Color or SimpleTouch for $20 less AND a free Nook Gift Bag!. Limited time offer - ends 5/12! Click and check it out for details. Looking for a new camera, but not sure where to get it? Well, right now you can grab triple Reward Zone points when you buy any camcorder, point and shoot camera, compact system camera, or digital SLR camera at Best Buy. As usual, read the offer details! Use Promo Code MOM to enjoy 15-20% off your purchase online at Macy's. Expires May 7. Worried you can't afford to get Mom the gift she deserves? grab some great Mother's Day discounts on Amazon. It looks like a fantastic sale, with some gifts up to 70% off!